Is Do-It-Yourself as good as Off-The-Shelf? I'm frugal. It is more accurate than what my wife calls me: "cheap". It means that I don't like to spend money, but when I do I want a good return on my investment. 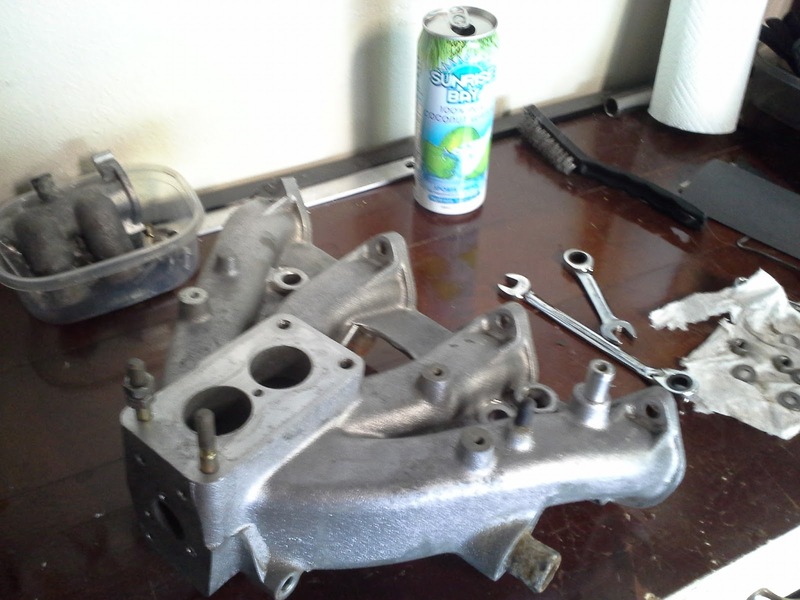 I went ahead and purchased a used Weber 38/38 carburetor as an upgrade. While I have a stock cam and compression I may upgrade in the future. The Weber has larger throttle plates so it will not fit on my stock two-hole intake manifold. What follows is my "Frugal" DIY way of modifying the stock manifold work. 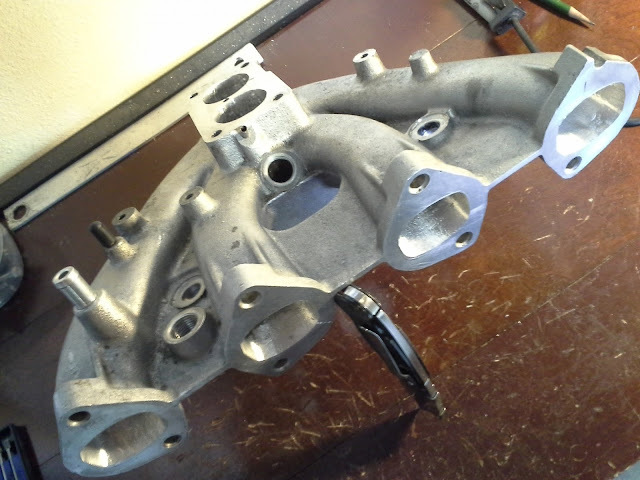 While not "machine shop pretty" I believe that its a good attempt with minimal downsides and possibly great benefits. 1. 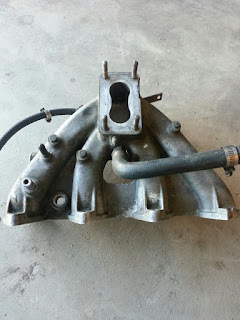 Buy a different model "peanut" style stock manifold that has a larger, single opening at the top. 2. 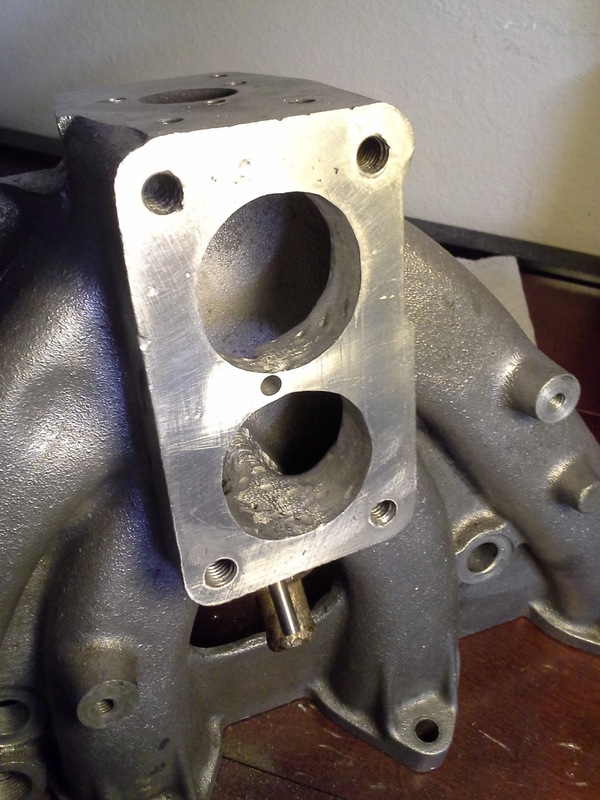 Buy an aftermarket Canon brand manifold that has a large Oval machined out of the carb mount. Commonly called the "NASCAR oval" due to the oval design's use on NASCAR V8 engines. 3. Modify the existing stock two hole manifold to allow fitment of the larger carb's throttle plates. I'm crazy enough to try my hand at most things. 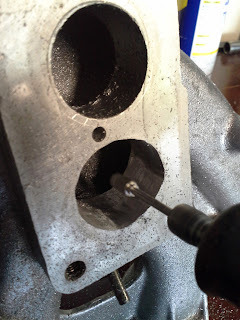 The way I see it, the downsides of modifying the intake myself seemed fairy small. It's not an expensive proposition to modify the existing intake manifold if you already own a die grinder or a Dremel. If all went wrong I'd just buy an aftermarket replacement. If the DIY works I'd be saving $100-200. Ultimately, the consensus is that on a street driven car most intake manifold differences are so small as to be inconsequential. Me being "frugal" I decided to give it a go. 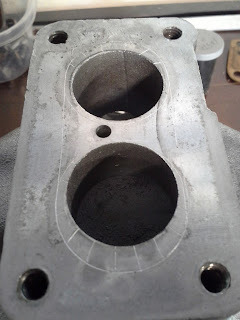 I used the carb gasket to scribe the wider area that needed to be removed. I decided on a two hole system as opposed to the large oval after some research on intake and plenum design. The wide open "NASCAR ovals" allow uninhibited flow and work best at wide open throttle for higher horsepower at high RPM. 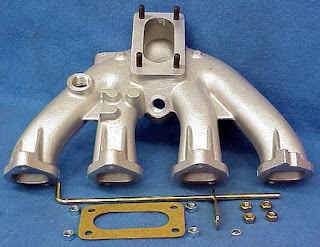 The two-hole system works best for part throttle situations where the partially open throttle plates disrupt the fuel-air path and the extended walls help redirect it before it enters the plenum. 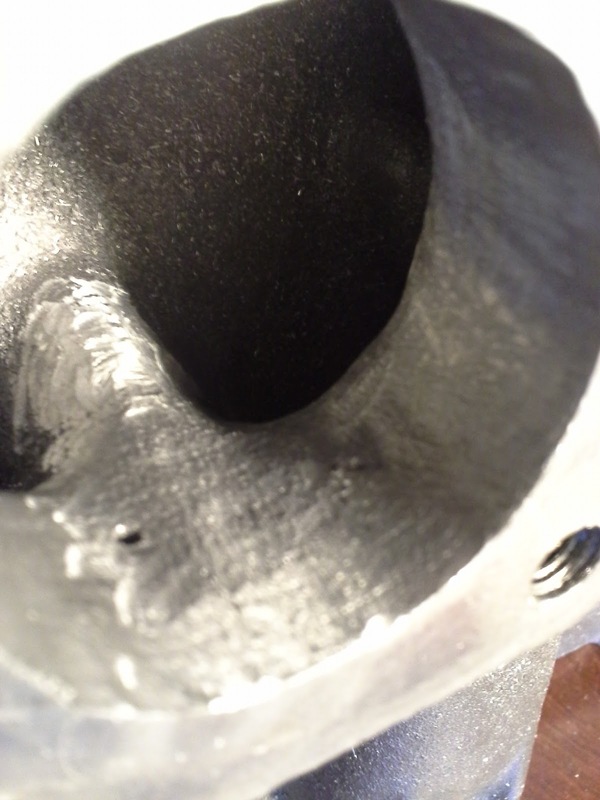 The carbide burrs did a good job of cutting through the aluminum. 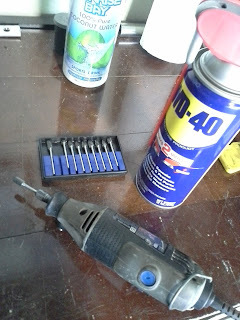 I sprayed WD-40 occasionally to keep the burr from packing up with aluminum and to keep the dust down. The burrs worked well. 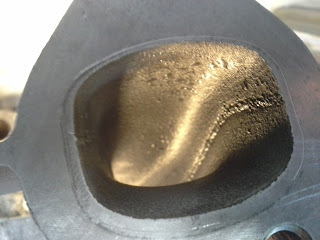 They are not super fast but with patience they got through the material just fine. After I got the diameter needed, I widened the inner walls and carried the angle inside as far as I could. 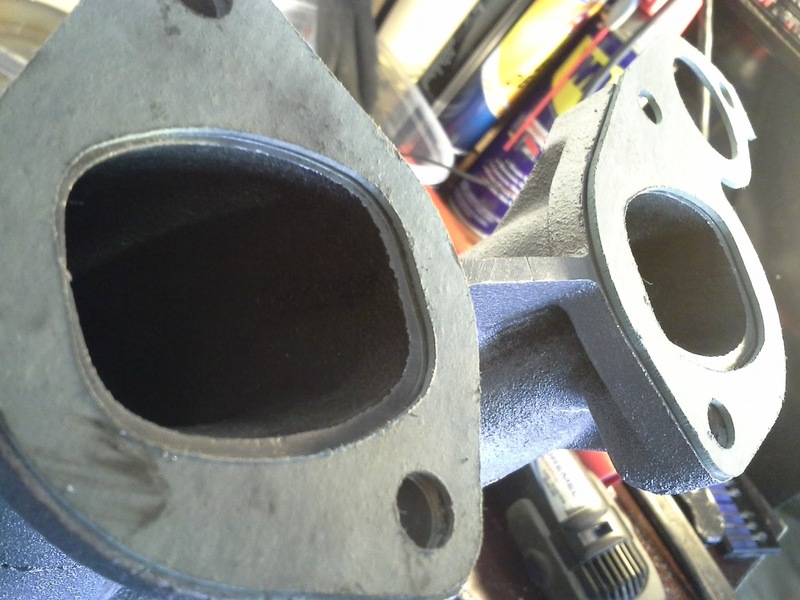 The hardest thing for fuel-air suspension to do it turn a 90 degree corner from the carb into the plenum and the intake runner. The smoother transition from carb to plenum area should help the fuel-air transition better. Inside the plenum looking at the modified intake hole with flared inner sides. I added "dimples" to break up laminar flow on the walls but I'm sure it's fairly insignificant (ie: couldn't hurt). 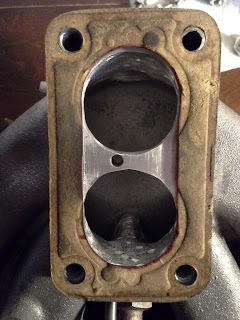 Finished product under the old gasket. 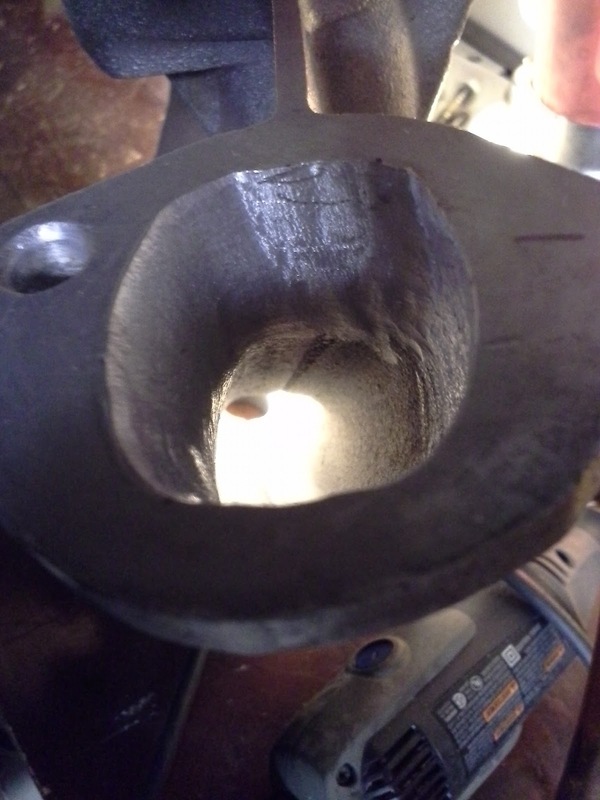 I will take off just a little more from the top hole. It's extremely hard to get a perfectly straight circle by hand but its close enough to do its job. 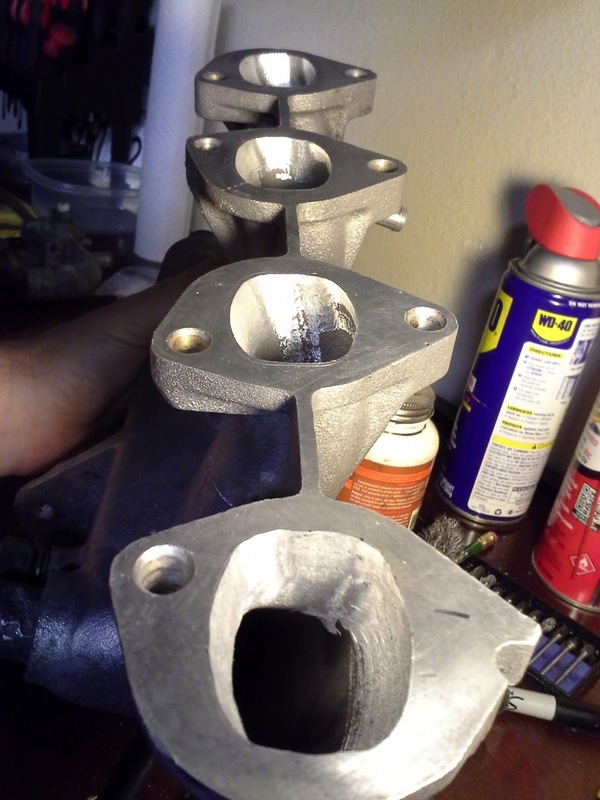 I then turned my attention to the intake runners. 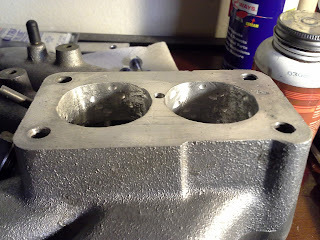 I gasket matched the ends of the intake runners and took off any casting marks or sharp edges. The Dremel can only reach inside about 1.5" so there is definitely a limit to the effectiveness of the port match. 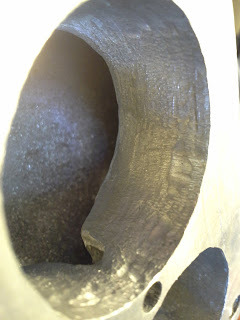 The smallest cross section in the runners seem to be halfway up. 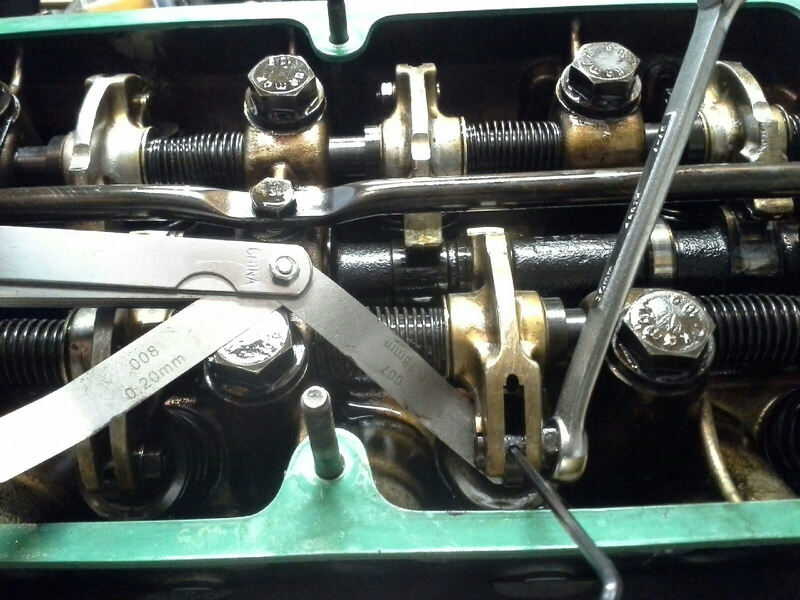 After reading some interesting home flow bench work done by FAQ member "PatAllen" seen here I decided to lightly deburr cylinders 2-3-4 and turn most of my attention to cylinder #1. According to his tests that cylinder has the worst flow characteristics, possibly causing an imbalance in air-fuel-ratio to the #1 cylinder. As you can see there is a big difference in available port size. The head ports are nearly at the gasket opening. Time to grind! Feel free to tell me how I irreversibly messed up or somehow lost all my torque potential, or how I did just fine. 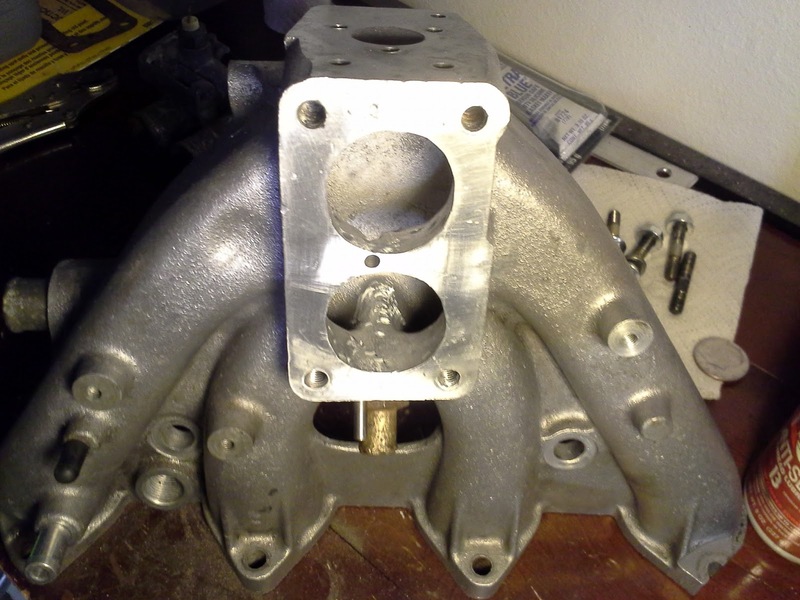 Minimal gains if any but it WILL fit a Weber 38/38 synchronous carburetor so as far as I'm concerned...Mission Accomplished. So what do you think? Waste of my time or a great way to save cash? Previous entry "Are you done yet?" I'm no expert...number one...great job at trying it! "Built not bought" is my motto. I have a 38 and got the Canon intake for a few reasons. My mechanic at the time said it would make installations ALOT easier as well as tuning. How correct is this? 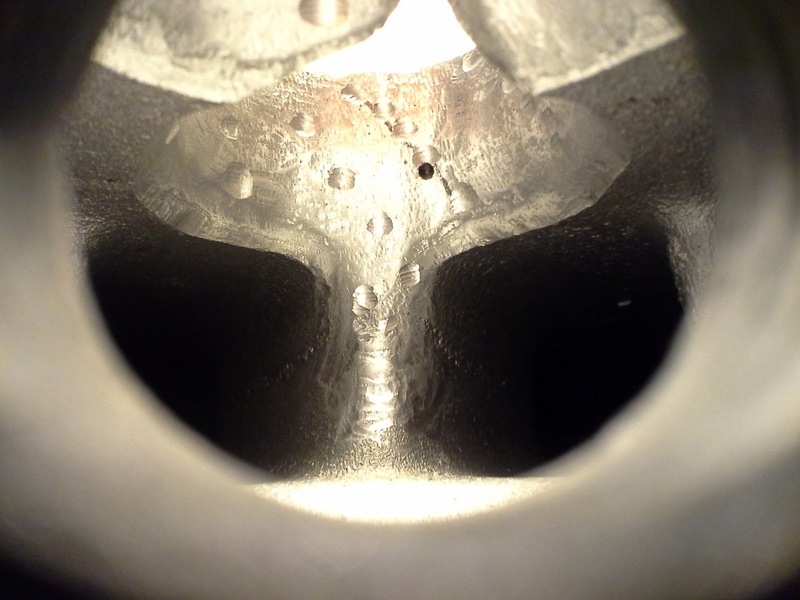 I dunno...but I do know that the weber 38 is notorious for being hard to "dial in" and I would bet that maybe this is due to the intake...Try it and report back.